Perfect for snacks or on the go breakfasts, these chewy and hearty vegan breakfast cookies are filled with dried fruit, seeds, and of course, chocolate chunks! This post is sponsored by Enjoy Life Foods. Thank you for supporting the brands that make this space possible! Summer, summer time. It’s the time of year I always feel like flies by way too quickly and always seems like a time when we deserve a break. Remember when we used to get summer breaks during the school year? It was a perfect time to reset, recuperate and just soak up the sun. While I usually try to scale back and enjoy the summer to its fullest (hence why I haven’t been posting as often), it’s easy to get caught up in the scheduling and chaos of ALL the things happening throughout the season. As a chronic overscheduler and overdoer, I’ve found that leaving a few nights or weekends open has helped immensely, especially when there is a chance for last minute happy hour drinks or a few hours free to sit on our patio to enjoy the longer days. Plus, more time to eat vegan breakfast cookies, am I right? One of the bigger things that usually keeps me grounded in a busier time of life is food. It usually nourishes and fulfills at the same time, providing energy to go out and conquer everything or just force us to slow down a take a second to really take in what’s going on in the world around us. These vegan breakfast cookies are a perfect snack that shows that a filling snack can be easy to grab and go, but can also provide freedom from worrying about grabbing something that will slow you down. I love that these cookies have a heavy dose of the good stuff, like fruit and oats, while also getting in the daily dose of chocolate chunks too. Food freedom is a funny thing in our food world today. Everything seems to be labeled as something, whether it be vegan, gluten free, organic, etc. but how much freedom do all of these labels actually give us? One of the reasons I’m partnering with Enjoy Life Foods is the quality and caliber of products they manufacture. Their chocolate chips and chocolate chunks are always consistently in my baking cabinets, providing me with chocolate morsels that are always, without a doubt, free from dairy. Not having to worry about reading through the ingredients list and finding something in there that won’t agree with me later is especially freeing. I can make chocolate chip cookies without picking through all the chocolate chips in the store? DONE. 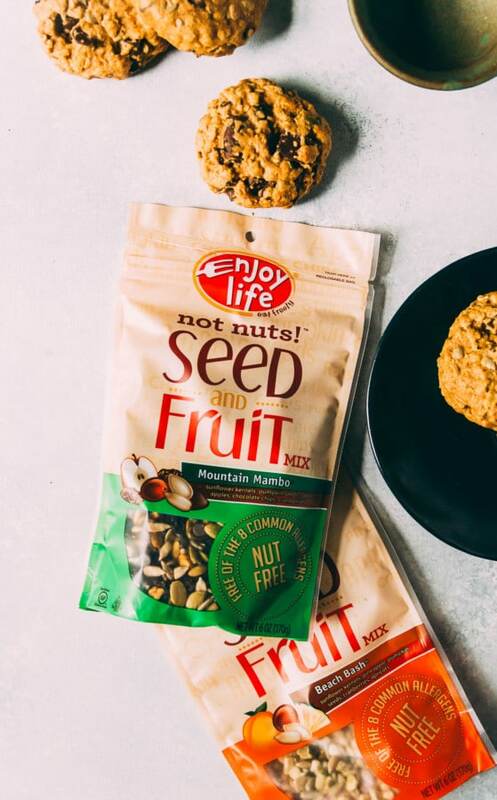 I also used Enjoy Life’s newer Seed and Fruit mix in these vegan breakfast cookies, giving them a little more heft and substance to carry me through going from yoga to work or making them easy to grab while in between meetings during the day. I’ve loved trying out and getting to know Enjoy Life and their philosophy more, they are insanely passionate about making allergy friendly products readily available and provide so much freedom from trying to decipher labels or ingredients on all of their products. Hope you are having a great weekend! We have been struggling with internet issues over here (after finally resolving some car troubles a few weeks ago) and I’m crossing my fingers it will be back soon. I’m trying to soak up the last of summer, so hope you are doing the same! In a large bowl, whisk together the rolled oats, flour, baking powder, salt, and cinnamon. Set aside. In a small bowl, whisk together the peanut butter, melted coconut oil, maple syrup, and vanilla extract. Add the peanut butter mixture to the oat mixture and stir with a spatula until combined. Fold in the fruit and seed mix and chocolate chunks until mixtures starts to come together. Scooping out by 1/4 cup, press the cookie dough into balls and flatten on the cookie sheet, until all cookies have been formed. Bake for 10-15 minutes, until edges are golden brown. Store in a sealed container for up to 5 days. The samples you made for us were delicious! These cookies looks so tasty! My son love cookies so much! I will try to make this for him. Enjoy that summer! I’m glad you’ve taken a step back to have some free weekends and evenings. As you know I’ve been doing the same, and we’ve both been going through some stressful times. Cookies def help!! And I love a cookie you can eat for breakfast.